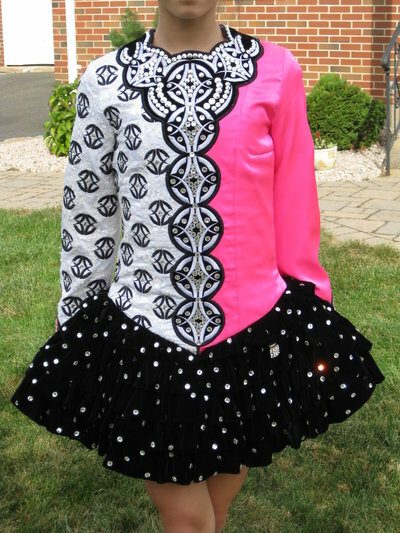 Beautiful Siopa Rince dress in hot pink satin, bright white satin and lace with black embroidery and a black velvet layered skirt. Adorned with hundreds of Swarovski crystals on front bank. Excellent condition, no fraying or stains on outside. Beautiful dress on stage, very sparkly. Feel free to ask more questions. There is room for let out and let down and can be easily taken up and in if needed.